Don’t panic! Panic! At The Disco is coming to Cleveland! Panic! 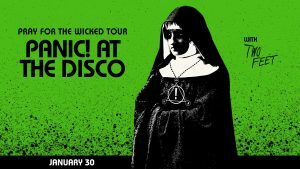 At The Disco brings their Pray for the Wicked Tour to Quicken Loans Arena (1 Center Ct. Cleveland) this Wednesday Jan 30 at 7 p.m.
Purchase your tickets today at https://www.theqarena.com/events/detail/panic-at-the-disco-190130.